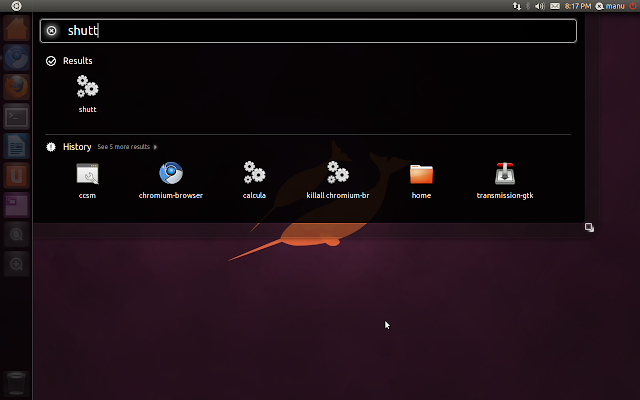 We have been following Ubuntu 11.04 closely and have thoroughly reviewed Ubuntu Natty Alpha 1, Alpha 2 and Alpha 3 releases. While the first two releases dealt with adding more and more features and functionalities primarily, the latest Ubuntu 11.04 beta release and the one prior to that concentrated on actually bringing in more polish and stability to Unity Shell. And they are indeed doing a pretty good job IMO. After trying out Ubuntu 11.04 beta for sometime, I decided that I need to do a bit more about it than simply testing it out for the sake of reviewing it. 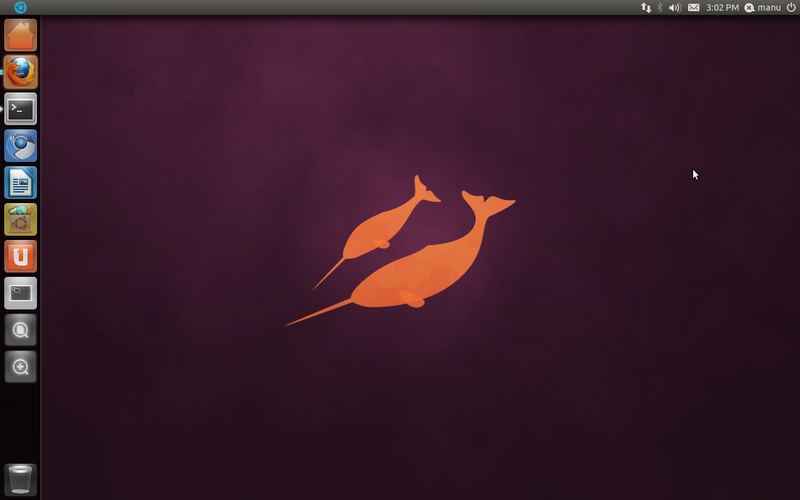 And so I installed Ubuntu 11.04 beta replacing my old reliable workhorse, Ubuntu 10.10 "Maverick Meerkat". 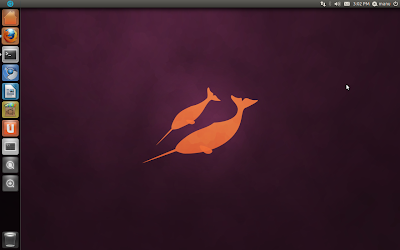 I have been using Ubuntu 11.04 Natty Narwhal beta 1 as my primary OS since then. The second screenshot introduces to a new impressive feature. In the Ubuntu installer, there is an option now that lets you upgrade directly from Ubuntu 10.10 to Ubuntu 11.04 using Live CD, a feature I always wished for since it saves a lot of time and bandwidth. A very nifty addition indeed especially because of Ubuntu's 6 month release cycle. 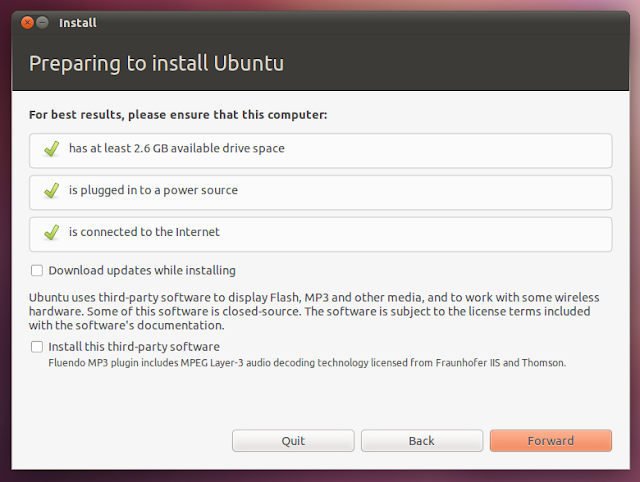 Instead of upgrading though, I went on to install it manually completely replacing Ubuntu 10.10. If you are someone who loves to use keyboard shortcuts in Ubuntu, this is probably the first Ubuntu Natty release that has taken YOU into account. Alt+F1 takes you straight into first item in the Unity dock menu and can browse through the dock further using up and down keys. You must be familiar with the feature shown in the above screenshot already which came into existence during the third alpha release of Ubuntu 11.04. Press and hold the Super key and a whole gamut of keyboard shortcuts are displayed. Though there are no big changes in terms UI since Unity itself is *the* biggest change, there are indeed a number a minor UI improvements which brings in a lot of polish and finesse to the Unity interface. Unity has developed a number of rough edges as well in the process. Not only did the developers included GNOME Control Center as a default application, there is now an menu item called System Settings(see the screenshot above) that will take you straight to the GNOME Control Center. Alt+F2 is also available by default though there is no auto completion of application names or commands yet which makes it rather useless. There are already dock items specifically to search for applications as well as files and folders with dedicated shortcut keys. 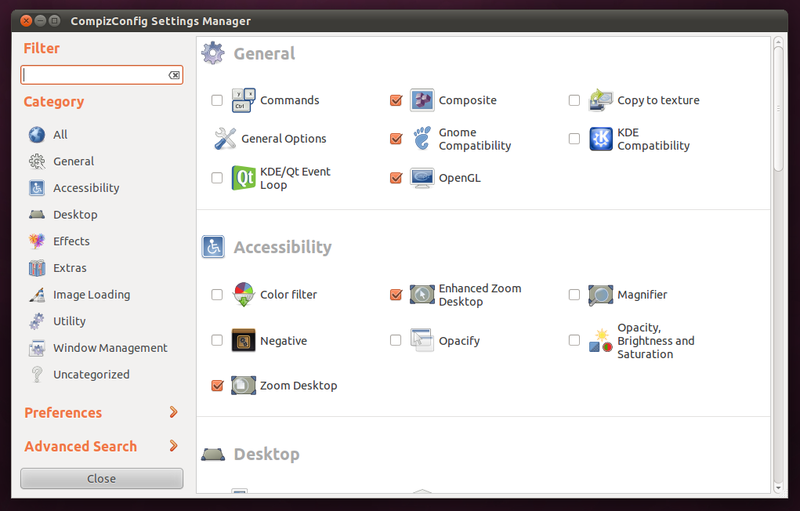 CompizConfig Settings Manager(CCSM), so far my biggest disappointment. There are many useful compiz animations that I used to use on a daily basis, like desktop zoom functionality for example, which were missing. So I went on to install CCSM. I was in for a nasty surprise. Whenever you try to enable *any* new Compiz animation, Compiz window manager crashes and restarts. This is a very big problem when you consider the fact that everything about Compiz was buttery smooth in the old GNOME desktop. Now you can hover your mouse pointer over the volume indicator and change the volume by simply scrolling. That's a nice touch. Now you can drag n' drop files directly into applications docked in the Unity dock and when you drag a file into it, only supported applications are displayed and every other entry fades away. Another nice touch though it has its share of problems. I was trying to move an image file directly into my home folder, but as you can see only Firefox was 'enabled'. 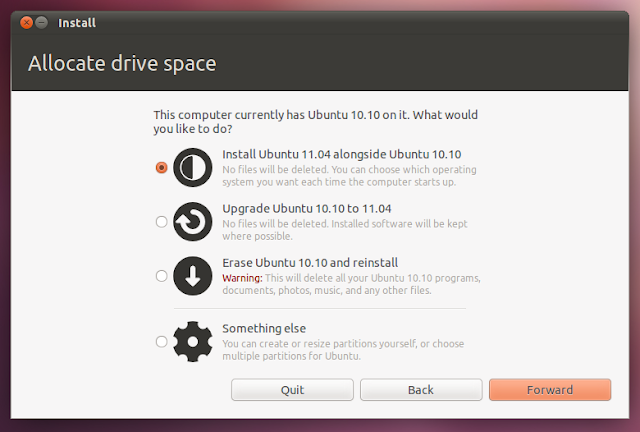 Ubuntu Software Center keeps on improving. Latest Ubuntu Software Center update adds much needed reviews and ratings support. 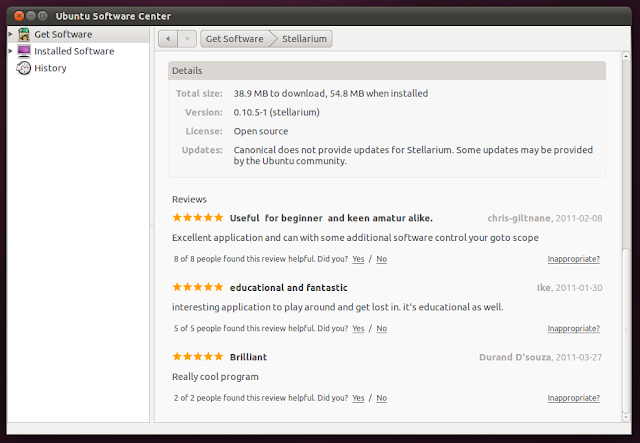 Now you can rate your favorite applications from within Ubuntu Software Center and can even write quick reviews/comments about them. This is the first beta release of Ubuntu 11.04 and there is not even a month left for the final release to happen. I think its time to scrutinize Ubuntu 11.04 a bit more closely. Here are some of the things that requires immediate attention. There is no dock resizing options yet. The current dock is very big for my taste. May be an option to hide dock while not in use is also preferable. 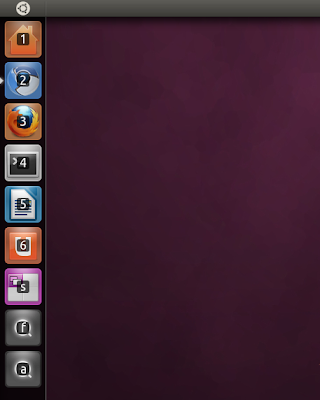 Compiz is not anywhere near stable, rough edges galore. As we have noted earlier, drag-drop of files not working properly. As of now, you can't drag-drop applications into Unity dock. You need to open the desired application and choose "keep in launcher" option to achieve the same result. Very unintuitive IMO. CompizConfig Settings Manager is an absolute disaster. Installing CCSM used to be among the first things I did after installing Ubuntu, but with the current state of affairs it is not at all recommended. Global menu won't work as expected every time. 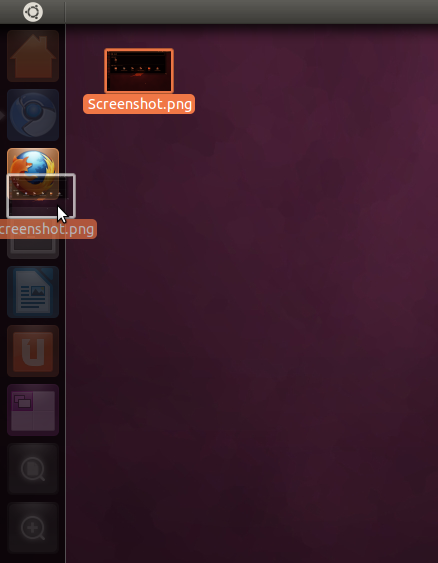 I like where Ubuntu is going with the new Unity interface. Take dock for example, the number of most frequently used apps for me is around 5 to 6 and listing them in the dock makes it so damn easy and preferable to the old GNOME ways any day. Global menu is awesome and Compiz is way better than the Mutter window manager of GNOME Shell. But a number of minor flaws spoiled the overall experience. But yes, this is not the final product and I just hope that Canonical is able to iron out all the issues prior the the final release.